Utility Providers: Do You Have A Survival Strategy? Utility providers around the world face unprecedented challenges due to rapidly changing market demands, and many are failing to keep up. With little to no competition from others within the industry, utilities providers in the past have been slow to embrace disruptive technologies and keep up with evolving customer expectations. This lack of competition has historically led utility providers to sit back. Why aim for progress when the competitive pressures to innovate are pretty much removed? Then, the market changed. There was a huge swing in the type of experience customers would expect from a company. Not only are customers demanding more from businesses across all industries, but there’s also increased competition from renewable energy options such as solar power. The traditional utility business is under pressure. They can no longer simply “keep getting by.” They must adapt to an increasingly digital world and equal the customer service offered by other service industries such as telecommunications or retail banking. While it’s true that many utility companies are still behind in customer service, a new survey from J.D. Power shows they are improving. On a 1,000-point scale, utility providers reached an overall customer satisfaction score of 680 - up 12 points from last year, and the fourth consecutive year of improvement. This compares to other services such as auto insurance which had a customer satisfaction score of 811, retail banking at 793, and airlines at 726. While utility providers may have lagged behind some of these other sectors in the past, they are rapidly catching up with the adoption of new technologies such as notifications and alerts, ebilling and smart meters. Utilities of the future, or in fact the present, must develop a greater focus on their customers. Utilities must invest in greater customer insight to understand what drives satisfaction and to identify opportunities for new services and ways to increase the customer experience (CX). Today’s utility customers want to be notified about the occurrence of outages, about their energy usage, receive energy efficiency tips as well as many other services that require innovative new technologies. That means utilities must now improve the engagement they have with their customers, and offer something of greater value. Customers demand an increased dialogue with their utility through new technology such as outage notifications, and they want tips and insights into how they can reduce their energy usage through smart meters and detailed data. These technologies are no longer just “nice to have.” Customers are demanding them right now, and failing to adapt could have future consequences for your business. When it comes to technology, it’s not just about customer-facing innovation. In fact, innovative back-end technology is a key component to how you run your business and will determine how customers rate their experience with your utility. Automating your workflow is now essential to high-quality customer service. In fact, according to marketing research firm IDC, companies lose between 20 percent and 30 percent of their revenue annually due to inefficiencies in their customer service department. Automated forms and workflows will remove the strain on your company due to inefficient manual processes, and that will result in happier customers and an increased return on investment (ROI). Customer queries will be automatically sent to the correct departments which will save time, customer service representatives will be freed up to work on more complex tasks to offer customers higher value, and customers will be provided with a seamless and easy service that they’re happy to experience time and time again. Without a company culture that’s willing to accept change, then it’s likely that your utility will be left behind as non-traditional competitors continue to push into the energy space. One way to counteract this is to attract and retain a team of talented employees that bring next-generation thinking to the forefront of your business. Giving this team increased freedom to test new and innovative technologies will keep your utility on track with the latest customer service trends. Not all changes need to be so significant. 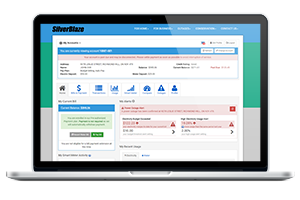 There are some solutions, such as SilverBlaze’s Customer Portal for Utilities that can seamlessly integrate with your existing business processes while also offering significant benefits to your overall customer experience. Want to learn more adapting to the future of the utility industry? Contact SilverBlaze today.